Our product made from real wood that's real texture and color naturally gorgeous we choose nice gain of wood to made every product with high quality handcrafted and unique design. Every piece of wood is natural unique, so the color and gain of product that you will receive might not be identical to the shown image. Ramakien Edition : " Sukreeb " The Monkey charector in Ramakien Thai literature. His body is Red. He is son of the sun. 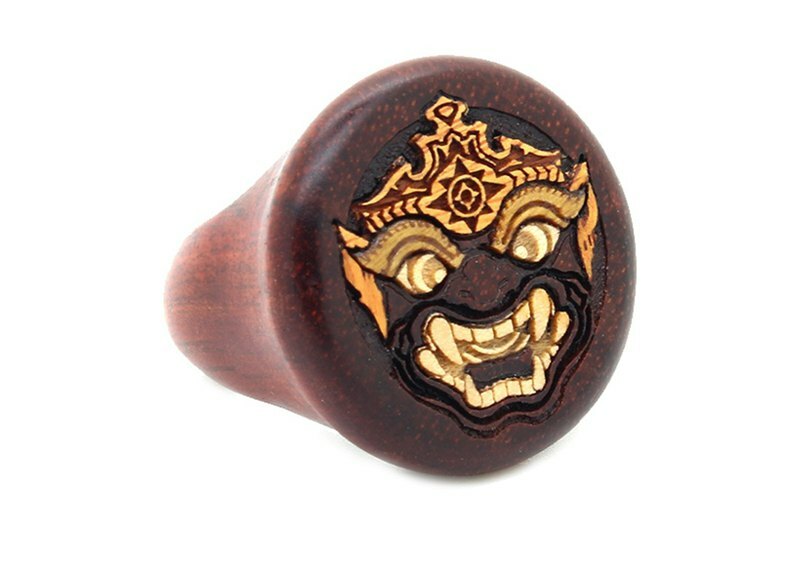 Material Ring : Blood wood Inlay with engrave : Tembusu wood[yellow] , Vera wood[green] , Maple wood All Gleamwood product are waterproof with non-toxic agent It is the same that used on children’s wooden crockery. We pay attention on our merchandise and aim for them to be usable on even the most sensitive or allergy-prone skin. The coating agent we use is up to the standard. It causes no contamination to the environment and helps strengthen wood flesh, makes our products more durable for use.